Kathryn Wallack is a veteran of 13 years in oil painting with the Bob Ross style and will be walking you through the many styles and applications of such. 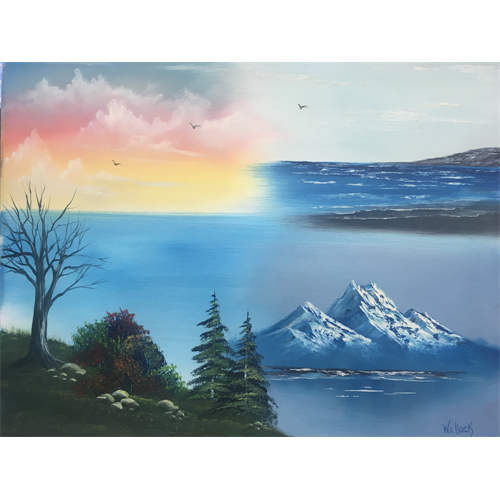 In the morning of this 8-hour course Kathryn will cover techniques on how to create clouds, mountains, trees, & water as well as share in depth knowledge of the mediums involved. In the afternoon, you will implement all covered techniques into forming your own masterpiece with guidance and support when needed. From this class you will be leaving with two canvases, one you have practiced on and one with your final piece. Those who register for this class will be entered for a chance to win special giveaway prize! Register for all three classes and you’ll be entered for a chance to win $150 Gift Card for Artists Emporium! Please bring a lunch if you have any dietary restrictions. Pizza, popcorn, coffee, and tea will be available. The use of all supplies is included.